It was a casual comment said in passing. A common occurrence in the red house of Oregon. “Kareem Abdul-Jabbar is writing a book.” I glanced over at my sister. “The basketball player? That one?” I was, yes, a little surprised. I was even more surprised that my sister would mention this. Everyone writes memoirs. “Yeah, that one. And the book’s about Sherlock Holmes’s older brother.” I tucked the information away as one more strange fact to bemuse people at late night Gothic gatherings. 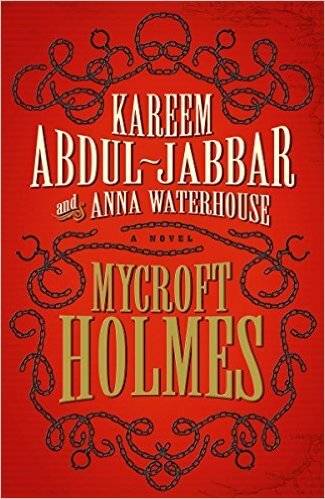 Time passed, as it does, but then one day I found myself staring at the blood reds and interlocking slave chains gracing the cover of Mycroft Holmes by Kareem Abdul-Jabbar and Anna Waterhouse. It was real, and it would prove quite good. Mycroft Holmes is based on the elusive character not of the famous detective himself, but that of his older brother. Doyle created the characters as a backdrop to Sherlock’s life, but there are rich details in some of the stories. Doyle hints at a very important role in the British government. He is, like his younger brother, brilliant. Unlike Sherlock however, Mycroft is impractical at the art of detecting. He can catalog and analyze, but he lacks the “street smarts” that characterizes much of the Sherlock Holmes tradition. With this background, we approach Mycroft Holmes. It is not an entirely original novel. The characters are, of course, the creation of another author. The pacing and style are very similar to Doyle. These elements do not, however, detract from this entertaining read. Unless someone channels Doyle with a little conjuring, there will be no more stories from the master of suspense. Like Lovecraft, Doyle has inspired fans to continue his legacy. 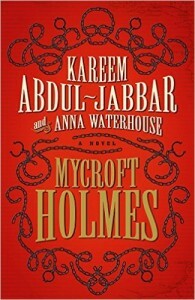 Holmes is in public domain, and Abdul-Jabbar and Waterhouse bring the immortal characters and the immortal detective format into the modern age. The authors skillfully maintain the integrity of the time period, while at the same time, infusing the tale with modern elements. Douglas, Mycroft’s black friend from Trinidad, is an intelligent, shrewd businessman forced to work behind the scenes in the restricted, narrow world of Victorian England. Mycroft’s fiancé comes to a bad end, but her eloquent discussion on the role of women during this period is raw and authentic. Mary Wollstonecraft would be proud. For Holmes fans, this is a wonderful treat. The book is well-written and the plot moves. The narrative structure is familiar enough through Doyle, but modern enough to please twenty-first century readers. The mystery angle is well-developed, and there were no obvious plot holes to drive that proverbial truck through. Mycroft Holmes makes a nice addition to the Doyle catalog of fan-inspired literature, and should be on every Sherlock fan’s shelf. Alex Scully is senior editor for Firbolg Publishing, reads voraciously, and owns very crazy animals.